It's a terrifying feeling: the ground trembling and rippling under your feet, buildings swaying all around you. Our immediate sense is that this terrible thing, this earthquake, is a disturbance of the Earth element. Yet it is the deeply disturbed Air Element that is the real driver of these violent and powerful movements. A weakened earth force means decay and deterioration, a fading away of structure. While a fault line is a weakness in the earth’s mantle, it is Air. the motive force of all manifestation, that can shake the very foundations of this world. As part of the five-fold or pentad nature of mind, Wind Element is the force of creativity. Adaptable, changeable, responsive, dynamic, it is pure magic in action. Through this inner force, we can build something tangible from a mere idea, creating beauty, scientific discovery, technological breakthroughs, innovation. Air Element is also the movement of nerve impulses, of thoughts, the winged mercury of personal and global communication. Yet this refined nature makes it highly sensitive to all kinds of disruption. The majority of physical illnesses are considered Wind disorders, according to both Hindu and Buddhist Ayurveda. When in excess it is also the basis of the kind of anxious, scattered, hyperactive emotions and neurotic intellect that are a hallmark of our modern world. If Air Element is magical in effect, when people create works of dark intent, they swiftly cross into the realm of “black magic.” And while Air is communication, its shadow side is lies and deception, double messages, the trickster. For the first time in the history of humanity, we have an entire industry—worth trillions of dollars—that is dedicated solely to misdirection, false images and “persuasion.” Besides marketing and advertising, public relations and spin are now standard in politics, entertainment, and business, in order to assure the manipulation of public opinion. Creative energy is harnessed to fabricate endless products, most wholly unnecessary and redundant, to fuel our current consumer model. The majority of these exist solely to create profit, and at the expense of the environment, and the welfare of humanity. This is Air Element gone wrong, and all of these actions have tremendous karmic impact, since nothing happens without consequences. This is clearly a global problem, but why might we ask, did this particular disturbance arise in the sacred land of Nepal? Karma is complex, and the karma of whole peoples and nations more so. We can only try to glimpse the historical, astrological, psychological and spiritual influences at play that culminated in an event of this magnitude. And the stature of the obstacles and negative forces that have impacted so many lives are formidable. Yet because of this, even our smallest personal effort is valuable. And no act, however small, is without effect. While many great Buddhist masters have prescribed helpful meditations, there are a number of ways that we can approach this from a strictly elemental perspective. On a spiritual level, Air Element is known as the Karma (Activity) Family, so any meditation that connects with this dynamic aspect of our inner and outer world will having great healing effects. Green Tara is the epitome of the beneficent energy of the Wisdom aspect of Air Element. And so her form, mantra and identity are perfectly suited to this particular situation. This practice is well known to a majority of Western Dharma practitioners, as well as being a staple mantra of the devoted lay followers of the East. 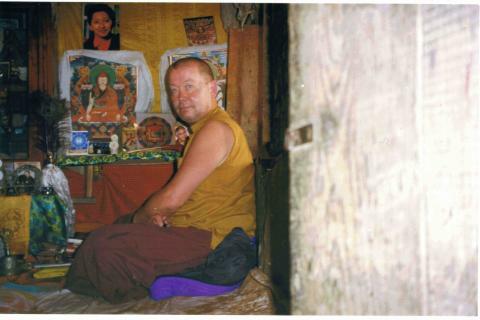 Om Tarey, Tutarey Turey So Ha echoes through the monasteries of Nepal, Bhutan, and Tibetan communities scattered across the subcontinent of India. One can also consider meditation and mantra recitation of the enlightened personification of the Air Element, Buddha Amoghasiddhi, and his female counterpart, Arya Tara. Another very powerful practice, while less well known, is highly recommended. Vajrayana practitioners are familiar with the meditation of Vajrasattva and the clearing of karma through this mediation and mantra recitation. But, as with all Yidams or deity forms, the full mandala consists of all five Buddha Families. Thus meditation on the Karma Family aspect has both the karmic clearing effect, as well as pacifying and balancing Wind Element disturbances. The visualization is similar, but instead of a white figure, we have the glowing green energy form of Green Vajrasattva (Karmasattva) on the crown of our head. Green ambrosia pours down through our body and cleanses form, energy, and mind, while dispelling any dark, smoky toxins. These leave through the lower part of the body and through all our pores. Note that this Karma Family Vajrasattva holds a double dorje in his right hand, instead of the usual single dorje. And for those that are used to envisioning the male and female forms together, all the better. Om KARMA Sato Samaya, Karma Sato Dveno Patishta, Dridho Meh Bawa, Sutokayo Meh Bawa, Supokayo Meh Bawa, Anurekta Meh Bhawa, Sarwa Karma Sucha Meh, Siddhim Shriyam Kuru Hung. Ha Ha Ha Ho, Bhagawan Sarva Tataghata KARMA, Ma Meh Mucha KARMA Bawa, Maha Samaya Sato AH. For those who wish something simpler still, yet just as effective, visualize a green semicircle of pure emerald luminosity resting in the sky; From that, effulgent green light pours forth, purifying the inner and outer dimensions. One could expand this cleansing process to the land of Nepal and to its people. However this is not recommended unless one feels very confident and skilled at “letting go” into pure openness, Meditations have real effects, and one may be confronted with some very tangled and difficult energies. Working on oneself is quite enough in any case! Remember, when we practice these visualizations and meditations, they do not take place “in our head,” but play out in the vast field of consciousness, the brilliant “dark matter” that is the real spiritual container of this matrix of appearance.